It wouldn’t change the military balance across the Taiwan Strait, but would signal a shift in U.S. support for Taipei. In the lead-up to the 1996 Taiwanese presidential elections, mainland China conducted a series of missile tests to express its displeasure against the pro-independence leanings of then-leader Lee Teng-hui and impress on the Taiwanese electorate that returning Lee to office might lead to war. The United States’ response to the so-called Third Taiwan Strait Crisis, which was to order two aircraft carrier groups to the area, did the trick. The largest display of American military might since the Vietnam War forced a humiliating Chinese backdown and persuaded Beijing it needed to modernize its military to counter the U.S. Navy. The Chinese move also backfired as Lee’s popularity in Taiwan gained a shot in the arm for standing up to the mainland. Back in 1996, China’s military budget was only about twice that of Taiwan’s and approximately 16 times smaller than that of the United States. Today, the People’s Liberation Army’s (PLA) budget is almost 22 times larger than Taiwan’s and over one-third that of the United States. China’s advanced short-range ballistic missile could destroy every runway attached to Taiwan’s six air force bases and destroy almost all Taiwanese fighter planes in the early moments of a war. The PLA has established superiority over Taiwan in the air, and on and under the water. The only thing the PLA cannot achieve is landing troops on Taiwan without suffering unacceptable losses. 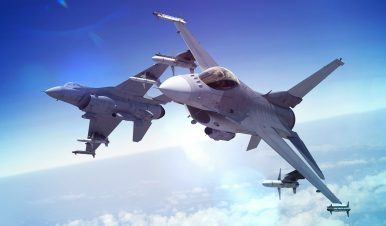 In late March, Bloomberg reported that U.S. President Donald Trump’s advisers had encouraged Taiwan to submit a formal request to buy up to 60 advanced F-16V fighter planes. Any sale must still be approved by Congress and would be the first major aircraft purchase from the United States by Taiwan since 1992. During her visit to Hawaii last week, Taiwanese President Tsai Ing-wen confirmed that Taiwan had requested a purchase of new fighter jets from the United States. Days later, two Chinese fighter planes crossed the median line in the Taiwan Strait that divides China and Taiwan – the first time this has occurred for 20 years. Even if the F-16V sale goes ahead, Taiwan’s new planes will not alter the military balance between China and Taiwan, nor dissuade the mainland from further provocations such as the median line flyover. That is not Beijing’s primary concern, however. The most important calculation China must make is not the relative capabilities of the Taiwanese armed forces but how the United States will respond in the event of a crisis or conflict in the Taiwan Strait. Every clue with respect to uncovering U.S. intention is vital because U.S. intervention could tip the military balance against China in any such conflict. In any event, it guarantees the end of any “acceptable cost” outcome in the event of conflict for China. Under the United States’ 1979 Taiwan Relations Act, any attempt to forcibly determine Taiwan’s future is considered “a threat to peace and security of the Western Pacific and of grave concern to the United States.” To prevent that, Washington is obligated to sell “arms of a defensive character” to Taipei to allow the latter to defend itself and dissuade China from launching any military action. Since the Bill Clinton era, administrations have denied Taiwan’s request to purchase new fighter planes on the basis that the grey line from “defense” to “offense” might be crossed. Speaking from Hawaii, Tsai let the cat out of the bag when she said the purchase of advanced fourth generation fighters would “greatly enhance our land and air capabilities, strengthen military moral and show to the world the U.S. commitment to Taiwan’s defense.” It is the last line which sends shivers down the spine of mainland leaders. Since the Taiwan Relations Act came into force, the United States has deliberately embarked on a policy of “strategic ambiguity” with respect to its military commitments to Taiwan in the event the latter is attacked. Whether the United States intervenes is a matter of political judgment and strategic assessment. Under the Barack Obama administration, the decision to only offer Taipei upgrades to its aging F-16 A/B planes suggested to Beijing that de-escalating tensions arising from differences over Taiwan was the predominant mindset. In contrast, the Trump administration has shown unprecedented willingness to escalate tensions with China over political, strategic, and economic differences. The speech by Vice President Mike Pence last October at the Hudson Institute and the 2017 National Security Strategy pulled no punches in identifying China as a comprehensive rival to the United States. If the sale of F-16V planes goes through, then, it is evidence that the mindset in Washington with respect to Taiwan has also changed and is less accepting of mainland sensibilities and demands. Such a sale would be an indication that preserving de facto Taiwanese independence is once more considered critical to U.S. and allied strategy when it comes to keeping the PLA confined to inside the so-called First Island Chain. That would be a significant blow to Chinese President Xi Jinping’s plans. In a wide-ranging speech on Taiwan in January to mark the 40th anniversary of the “Message to Compatriots in Taiwan” delivered to the 1978 National People’s Congress, Xi implied that “reunification” with Taiwan was a “historic task” he wanted to achieve during his tenure. A U.S. sale of F-16Vs to Taiwan — and all it implies — makes fulfillment of that task less likely. Finally, the strength of American support for Taiwan will influence how other nations respond to persistent Chinese attempts to reduce international space within which Taiwan can act as a de facto sovereign entity. The most important regional relationship for Taiwan is with Japan, which has emerged under Shinzo Abe as the political, strategic, and economic leader among democratic Asian nations. On issues such as the Trans-Pacific Partnership, Tokyo has shown initiative when Washington has been found wanting. The Japanese leader has emerged as one of the few regional countries to have established a strong personal relationship with Taiwan’s Tsai and is widely seen as the most pro-Taiwan leaders amongst U.S. allies in the region. Even then, Abe’s room to move is dependent on the extent to which the United States is willing to defend Taipei’s desire to behave as a de facto sovereign entity. Xi took a great risk in abandoning the rhetoric and diplomacy of China’s “peaceful rise,” which was promulgated by his predecessor Hu Jintao. Previously admired for his iron determination to achieve China’s great “rejuvenation,” Xi is now being criticized domestically for overreach and miscalculation. It is speculated that the legitimacy of the Communist Party would not survive the “loss” of Taiwan. If the United States goes ahead with the sale of F-16Vs to Taiwan, then the pressure on a president who has embarked on an unprecedented “anti-corruption campaign” to silence political enemies and doubters will be immense. Professor John Lee is a senior fellow at the Hudson Institute in Washington DC and United States Studies Center in Sydney. From 2016-18, he was the national security adviser to the Australian foreign minister.